Air conditioning systems are among the most useful things in the home especially during the summer season. They give comfort whenever the temperature starts to rise. But like other things in the house, air conditioners could also get damaged at one point in their lifespan. If you have an air conditioning system, you should do everything to keep it in top shape. This is so that it could serve its purpose properly. Here are some air conditioning maintenance tips that you might be interested in. It is very important that you change the filter of your air conditioner regularly. It should be done at least every two or three months. Filters get dirty overtime. Once they get clogged with dirt, there would be abnormal airflow and the air conditioner will not work to its full extent. Oftentimes, people forget changing the filters of their air conditioner. Once they remember doing so, it is already too late. It should be noted that changing the filter regularly could cause to less energy consumption. Filters prevent the condenser coil from becoming dirty. But through the months, the coil could get eventually get very soiled. Thus, you should take time and inspect your could about once a year. 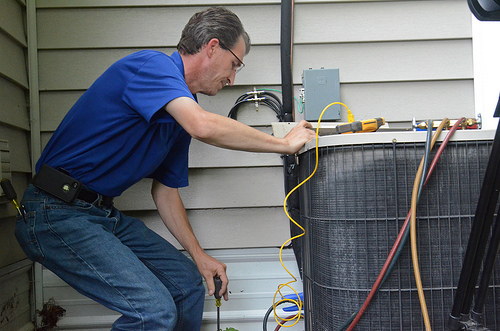 You could conduct more inspections than that if you use your air conditioning system a lot. Aside from cleaning the coil, you should also clean its surrounding area. Keep it clean from dirt and other debris. It is also very important to protect your air conditioner from the winter. The cold weather could be very harsh to your air conditioning unit. Since you would not need it during the cold weather, you might as well remove your unit and store it. You might also want to cover it and protect it from snow and debris. The drain pan is also another important part of an air conditioning system. You should take some time to inspect it and keep a watch against growing algae. Where there is water, there is always the risk of algae. Algae could grow and is usually the cause of clogging. A lot of people do not find it necessary to clean their air conditioning vents. But this is a must especially if you do not want dirty air being blown all over your house. Dusting your vents several times in a year is very practical. It also would not hurt if you hire expert cleaners so that your vents could be cleaned in a professional manner. Maybe you need your air conditioner to undergo minor repairs. Maybe you need a new air conditioner to replace your old, faulty one. When it comes to high quality air conditioning products and repair, services, you can always rely on Constant Home Comfort Service Group. It is one of the leading home energy improvement companies in Toronto and has been operating since 2001. You can expect nothing but the best from the company’s professionals and technicians!